Apparently, I am a legend. This according to Raj, one of the new friends I have acquired amongst the many stranded travelers hovering around the Holiday Inn Express, Dubai Airport. Raj has spread the word amongst his new motley crew of friends that I – a solo American female traveler – have done the unthinkable: I rented a car, and have spent the past two days driving around Dubai. "Legend" might be a bit extreme, but I can't help but laugh. I grew up in Southern California, where a life sans car just isn't a life. And further to that, I am a gypsy at heart. I thrive on movement. Having been brought to an utter standstill by one huge cloud of ash is driving me batty; being stalled in this "sandbox" (phrase borrowed from a friend) at an airport hotel, surrounded by nothing but abandoned construction projects – not to mention a lobby packed with cranky and anxious Brits – is downright suffocating. So to me there was no question; renting a car was the only antidote to this feeling of "stuck". Early Saturday morning, before I could think twice, I was at the Budget counter, where a reservation agent handed over my keys to freedom. I splurged on a navigational device (possibly the smartest 20 dollars I have ever spent) and set off on a GPS-guided city tour in a spiffy little Toyota - with manual transmission, thank you very much. Despite the breakneck speeds, the confusing road signs, and the maze of freeways and construction zones, driving around the city is actually a lot easier than one might think. In fact, I find it absolutely exhilarating. I do realize how fortunate I am that women are permitted to drive in UAE, although I have seen very few female drivers on the road. And just this morning I was warned by another new friend to take extra caution and avoid getting into a collision with an Emirati. (Seriously, I hate stupid warnings like this.) Reason being, supposedly their status as subjects under the Monarchy would make me, the foreigner, instantly and automatically at fault - no matter what. I don’t know how much truth is behind this, but of course the feisty redheaded New Yorker in me immediately responds with "Bring It". (To which you might respond, "whoa tiger!") But then I stop to consider where I am and who I am, and decide that it's probably best to keep my mouth shut and my eyes on the road, lest I get myself into all sorts of trouble. While at the rental counter, I had informed the agent that I might return the car in Paris. The overland journey couldn't take more than a week or two, could it? Concern flashed across her face; she wasn't so sure I was joking. 48 hours later, as the minutes tick past, more flights get canceled, and the volcano continues to spew dirty ash with no sign of stopping, I assess the tires on this mighty little Toyota and wonder... could I do it? Now THAT would entitle me to "legend" status indeed. 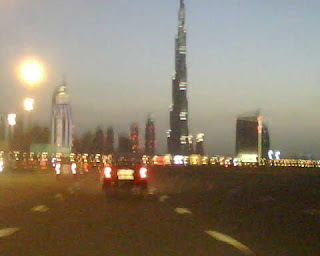 Burj Khalifa on the right: currently the tallest building on the planet.